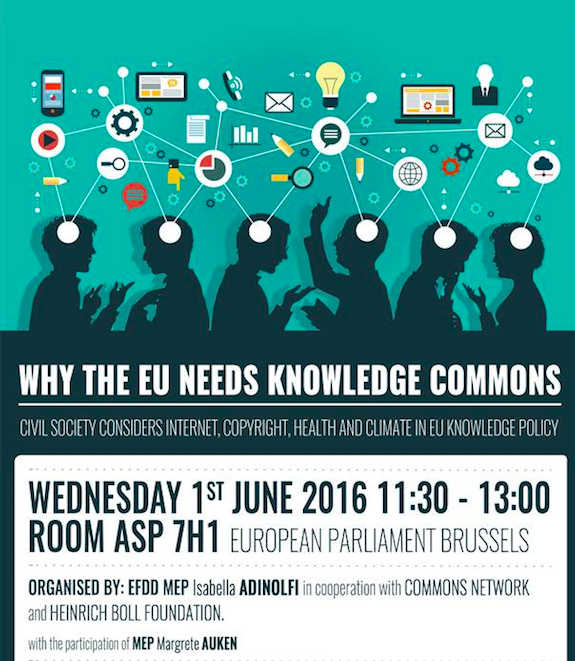 On June 1st, hosted by Isabella Adinolfi in cooperation with Commons Network, civil society considers Internet, copyright, health and climate in EU knowledge policy from a commons perspective.”. From 11.30 – 13.00 at the Altiero Spinelli Building – Seven floor – Room 7H1. The commons perspective stresses the democratic governance of knowledge as it identifies knowledge as a shared resource that is a collective responsibility. It emphasizes equitable access to knowledge resources such as health-care and education, the urgent need to prioritize ecological sustainability in knowledge policy and the promotion of an open and democratic Internet. In late 2015 the Commons Network published the paper: The EU and the Commons: A Commons Approach to European Knowledge Policy. It outlines the compelling logic, benefits and ethics of a commons approach to knowledge, with an emphasis on how that could improve policy in certain areas such as health, the environment, science and culture, and the Internet. We would now like to engage in a conversation with experts working in the various fields discussed, during an expert meeting in the European Parliament. This conversation will allow us to assess the usefulness and applicability of the commons perspective in policy making on knowledge, and how to concretely move forward in protecting and managing common goods. We shall be considering the EU policy context of the digital Single Market strategy, copyright reform, climate policy, internet and telecommunications governance discussions and the implementation of EU research and innovation programmes. If you require access to the European Parliament, please register by May 27th noon. Can Commons Thinking Break into the European Mainstream? For Peace, People and Planet.